The Congress on Sunday confirmed their party chief Rahul Gandhi, in addition to Amethi in UP, would contest from the Wayanad Lok Sabha seat in Kerala. The news enthused Congress workers in Kerala, who burst crackers and distributed sweets. Bharatiya Janata Party (BJP) President Amit Shah said Gandhi is running away as he could lose from Amethi. Communist Party of India (Marxist) leader Prakash Karat said the Left parties would work to defeat the Congress chief. The Congress strategy in fielding Gandhi from Wayanad is to galvanise its workers and support base in southern India. It is also consistent with its efforts to both maximise its seats, or put up a good fight even in tough battlegrounds, as Congress hopes to recover from the abysmal 44 seats it won in the 2014 polls. As part of this strategy, senior leaders are contesting key seats. Digvijaya Singh is contesting from Bhopal and there is speculation that Ahmed Patel could contest from Bharuch in Gujarat and Priyanka Gandhi Vadra against Narendra Modi in Varanasi. In Kerala, Congress leaders such as Ramesh Chennithala have taken to term the Wayanad move as a “twenty-twenty” match, or a clean sweep for the party in all of Kerala’s 20 Lok Sabha seats. The Left parties, which until now argued for “pooling of all anti-BJP votes”, are disappointed. The Congress and Left pre-poll seat adjustment has failed in West Bengal. The Left’s chances of winning more than a couple of seats in Bengal are slim, and with minorities in Kerala likely to turn to Congress, the Left Democratic Front could struggle in its last bastion. Wayanad, a picturesque hilly and forested district, part of the Western Ghats, is at the tri-junction of Kerala, Tamil Nadu and Karnataka. 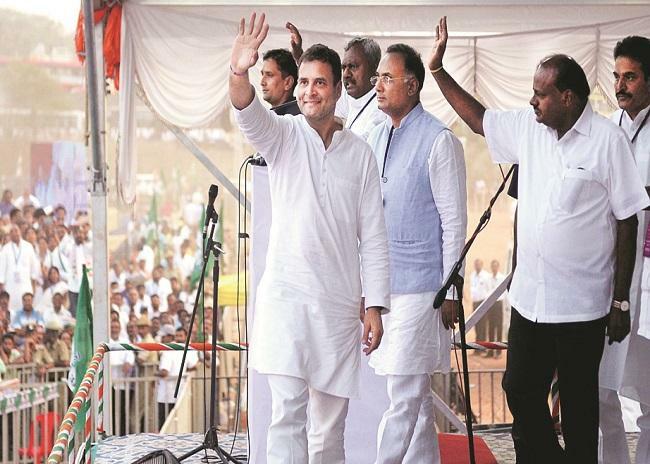 Congress strategists are hopeful that the Congress president contesting from the seat would help the party across the 87 seats of the three states — 20-seats of Kerala, 28 of Karnataka and 39 of Tamil Nadu, particularly in parts of Dakshina Kannada, Coorg and Mysuru regions of Karnataka and across the length and breadth of Tamil Nadu. Congress’s units in these three states had asked Rahul to contest from their respective states, pointing out that it will give them an edge as the Narendra Modi government had “neglected” the southern states during its tenure. According to party leaders, several opinion polls, Gandhi is ahead of Modi in popularity in the south. The Congress considers Wayanad a safe seat for itself. According to the 2011 Census, Wayanad has 49.48 per cent Hindus, 28.65 per cent Muslims and 21.34 per cent Christians. Reconstituted in the 2008 delimitation exercise, Congress considers Wayanad a safe seat for itself. In 2009, M I Shanavas from the Congress won with 49.95 per cent of the votes. In 2014, however, his victory margin dwindled from over 150,000 to 20,870 votes against the LDF candidate. Crucially, the seat has nearly 50 per cent minority population. “The survival of CPI(M) nationally depends on its Kerala unit, being a source of funds. Hence, this may affect its prospects in the Lok Sabha elections, as both the parties were expected to be on the same anti-BJP side. The move may have some impact in Tamil Nadu, but I do not see much change in Congress’s prospects in Karnataka,” said B R P Bhaskar, a political analyst. The Nehru-Gandhis have turned to contest from southern India when out of power. In 1978, Indira Gandhi had won a by-election from Chikmagalur in Karnataka after her party was routed in the 1977 elections. In 1980, Indira contested from two constituencies — Medak in present day Telangana and Rae Bareli. In 1999, Sonia Gandhi debuted in Parliament by contesting from Bellary and Amethi. Wayanad has an interesting history. Arthur Wellesley, who defeated Napoleon Bonaparte at the Battle of Waterloo in 1815, tasted his only loss in a war in Wayanad. He was defeated by then ruler of the area, Pazhassi Raja, known as Kerala Simham (Lion of Kerala). BJP chief Amit Shah on Sunday said Gandhi had not undertaken any development work in Amethi, and is running away since he faces a sure defeat. Alluding to the religious composition of Wayanad, Shah said Gandhi has taken recourse to “minority appeasement politics” to win. Announcing the decision, Congress leader A K Antony said Wayanad would send a message across southern states.